1. Add 1 – Silver-Plated 2x6mm 4-Leaf Bead Cap, 1 – Frosted Rose Quartz 12mm Semiprecious Round, and 1 – Silver-Plated 4x14mm 5-Leaf Bead Cap to a ball pin. 2. 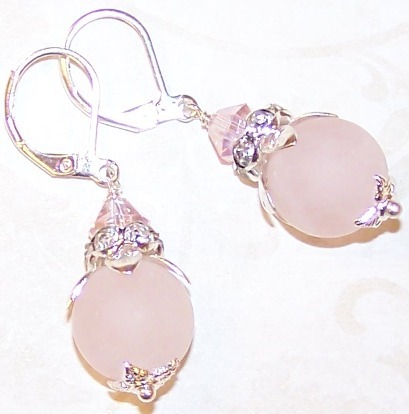 Squeeze the Silver-Plated 4x14mm 5-Leaf Bead Cap around the Frosted Rose Quartz 12mm Semiprecious Round shaping it to fit. 3. 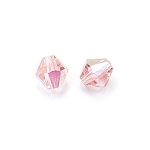 Add 1 – Silver-Plated 8mm Rhinestone Rondelle and 1 – Light Rose AB 6mm Crystal Bicone to the same ball pin. 5. Open the loop of one of the leverback earrings (just twist it like you would a jump ring). Add the loop of the drop and close the loop of the earring. 6. Repeat steps 1 – 5 for the other earring.